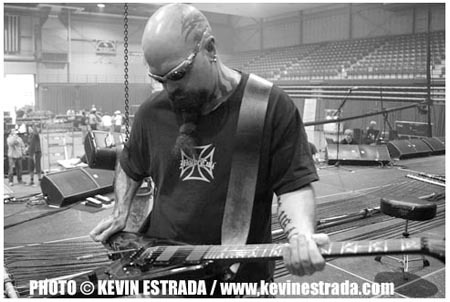 I started shooting Slayer in 1984…and in that time, I became close with the band. From sneaking my camera into the club shows to becoming a co-producer on the Soundtrack To The Apocalypse box set – it has been a great ride. But this one hit hard. At his celebration, every snap of my camera brought me closer and closer to the end of a big chapter in my life. I know Slayer will go on – in one form or another – but there is such a sense of unwanted closure. It is hard to put in words – so I am giving you a little taste of what Slayer gave me over the years. Thank you Tom, thank you Kerry, thank you Dave, thank you Paul and Jon…and lastly – thank you Jeff, and farewell. If I didn’t see kids texting on their cell phones, I would have had no idea that it was still 2008. Denim vests, patches, leather, spiked wristbands, miniskirts…I thought I died and was sent back to 1983. This is what happens when Hirax and Raven come to town. For those of you who don’t know, along with Metallica and Slayer, Hirax was one of the Southern California originators of Speed and Thrash Metal in the early 1980’s. 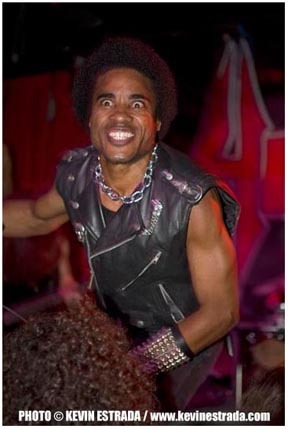 Twenty some years later Katon DePena and Hirax are still going for it. Before the show, I hung out with Katon in the dressing room…this guy still has Metal pouring through his veins. He was just as cool, just as pumped and just as motivated as he was in 1985 when their first LP was released on Metal Blade Records. As he and I chatted, I couldn’t help but wonder and appreciate what mountains he must have climbed to gain the respect that he has achieved in a genre of music that is predominantly white. Katon and the band brought it all to the stage – bullet belts, leather, smoke. 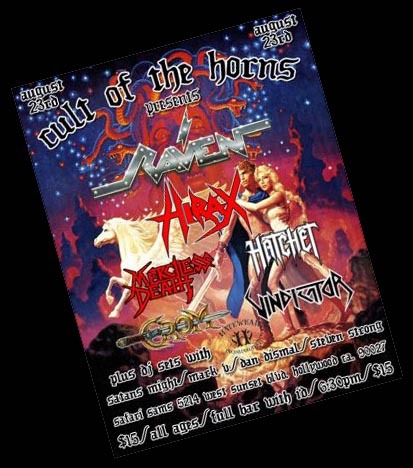 It is shows like this that truly keep metal alive. A whole new generation of metal kids have the chance to get a glimpse of what the glory days of metal were like. I will throw up some shots of metal godfathers Raven in my next post. Photographed with my Canon 5D, a Canon 70mm-200mm f2.8 lens and a Canon 580 EX flash. All shot on Manual Modes. Part five of a five-part series I am doing this week as I look back at the making of Slayer’s Still Reigning DVD. From load in to load out, I was there with the band. As we walked down the hallway back towards the band’s dressing room, I studied their bloodied faces. They looked amazing…even Jeff, who was not thickly covered in blood. I had to capture this moment. I told the band, “Don’t wash your faces, don’t even touch them.” Luckily, I had planned ahead and set up a couple of studio lights in one of the showers in Slayer’s dressing room…just in case they walked off the stage looking like they did at that moment. I didn’t even let the guys put their guitars down, I grabbed all of them and walked them straight in front of my lights. The band was still huffing and puffing as I snapped away. 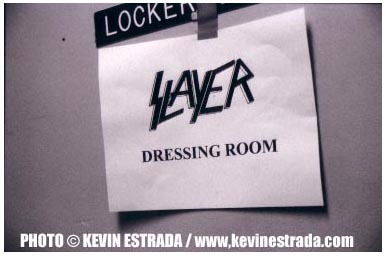 These photos have turned out to be pretty important shots in terms of Slayer History. All the Slayer guys were in great moods. Kerry and Jeff were comparing stories about how hard it was to play their leads on the slick, bloodied guitars. Dave explained how blood kept splashing into his face when he would hit his snare drum. I grabbed Kerry and Tom and did some bloody solo shots of them and then I told them that I was done and they could shower off. Funny thing is, I don’t think these guys wanted to wash the blood off…they probably would have kept it on all night if they could have. But the blood was starting to dry up and get sticky and hard. As I began packing up my gear, I caught a glimpse of Tom walking into the shower (yes, he was fully dressed!). I noticed how the blood mixed with the water…it just looked so morbid I had to photograph it. Tom loved the idea and I snapped and snapped as Tom rinsed the blood from his body and clothing. The photograph of Tom’s feet surrounded by a pool of blood ended up as the artwork on the DVD itself in the Still Reigning packaging. Surprisingly, Jeff was in great spirits despite the mishap. Sure, he was bummed, but he was so proud that his dream became a reality. Jeff’s answer to this mishap – “I guess we will just have to do it again…maybe take it on the road.” And that is exactly what they did. 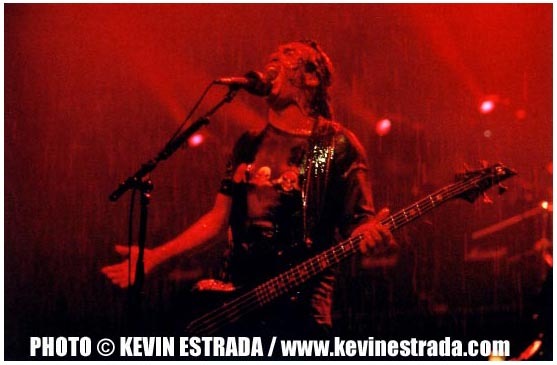 On their next tour, select cities and venues were treated to the bloody shower of rain – although the touring version was a much more toned down version. The pouring buckets of blood were missing and the pouring blood rain was a much more watered down version. Nevertheless, it was still very exciting to witness such an extravaganza. It was an honor to have been hand picked by Slayer to document this historical event for them. Part four of a five-part series I am doing this week as I look back at the making of Slayer’s Still Reigning DVD. From load in to load out, I was there with the band. One of my favorite parts of being a rock photographer is the final moments before the show. There is a certain electricity that is present when a band walks from their dressing room to the stage. You can feel the power of this electricity increase with each step as the band gets closer and closer to the stage. The energy must have been contagious because even I got caught up in the moment…I can be seen leading the band out of the dressing room on the DVD’s bonus footage. I had never seen the band more focused for a show than they were that evening…trust me, I have been seeing and shooting them since the early 1980’s. This was their night and their dream was about to be realized. As the band began to bring Postmortem to a close I knew it was due or die time. I glanced at the kids that were crushed behind me in the front row and they had no idea what they were about to bear witness to. I only had moments to get ready. The kids behind me looked at me like I was a freak when they saw me wrapping and covering my cameras with a contraption I had built out of cardboard, duct tape, and plastic trash bags. There was no way I was going to chance my camera equipment getting covered in blood. No one really knew how this thing was going to work. Kerry King and Jeff Hanneman began the screechy, dive-bomby guitar intro to Raining Blood. As Dave Lombardo jumped in with his pounding triple drumbeat, the stage lights began to turn on and off – blackness, bright light, blackness, bright light. Then we saw it, our first glimpse. Just as the stage lights turned on for that brief moment, huge buckets of blood – I am talking gallons and gallons of blood – poured down on the band. It was pure evil. I was sprayed with blood as Tom Araya whipped his head round and round as they roared into the song. Tom and Dave seemed to get the worst of it…they both looked like the skin of their face was cooked and peeled off. Kerry got it pretty bad as well, but his face was still visible. Surprisingly, Jeff, who was the mastermind of the raining blood idea, was virtually untouched by the blood. Jeff was having some guitar problems during the beginning of the song and walked toward his amp to fix the problem. In doing this, he missed his mark when the gallons of blood were dropped from above. I saw it on his face, he was pissed – and I felt terrible for him. But Jeff was a true professional and continued to perform the song incredibly. Then exactly on cue, as if they had rehearsed it a million times, the shower of bloody rain began. As Tom screamed out, “Now I shall rain in blood!” and Kerry and Jeff tore into their leads the impossible happened. The venue was raining blood over the stage. It was eerie and demonic, yet it was beautiful. Now the band, including Jeff, were being showered in steady blood-rain and it looked spectacular. For the first time ever, a crowd at a Slayer show were speechless, their eyes were wide open and they jaws were on the floor. The plan worked perfectly…the blood was contained within the stage, and the crowd stayed completely dry. Flawless. And the rest is Slayer History. As the band and I headed towards the dressing room, I couldn’t help but wonder how Jeff was going to react to the mishap on stage. And, what about the flipside to that – how was the band going to react to Jeff regarding the mishap? Was I about to see a huge Slayer blowout in the dressing room? 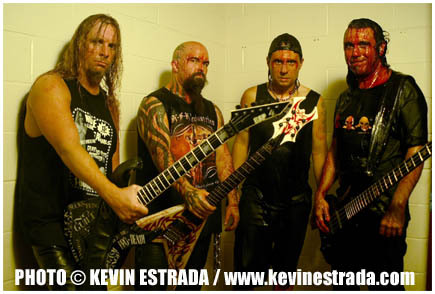 Stop by tomorrow as I conclude my weeklong retrospect on Slayer’s Still Reigning DVD. Part two of a five-part series I am doing this week as I look back at the making of Slayer’s Still Reigning DVD. From load in to load out, I was there with the band. As the teams continued to frantically work on the “raining-blood system,” the band readied for soundcheck. 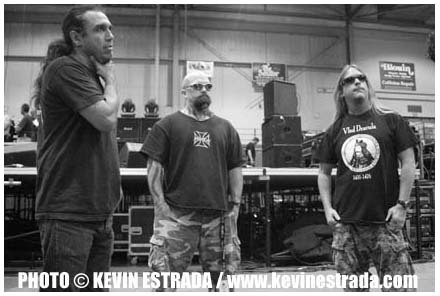 Slayer has gone through soundcheck a million times in their career, I am sure they can do it on instinct. Bit for some reason, the band seemed a bit unsure of things, they seemed to worry and stress over many minute details. Then I heard it, the band, especially Kerry, were very worried about their gear. As the raining-blood system had never been tested, no one knew how much blood was going to pour on their amps, drums and guitars. No one knew if their gear would make it through the song, and no one knew if their gear would be in working condition as they continue on with the Ozzfest Tour the following day in Boston. Kerry and Jeff also had concerns whether or not they would have control of their hands and fingers on their guitar necks once they were covered in blood. These guys are pros, and they wanted to be sure of two things: One – the fans at this gig got the show of their lives and; Two – that this DVD really captured the fury, passion and essence of who Slayer really is. As soundcheck commenced, it was time for us all to sit down and eat. During dinner, the band picked my brain, asking me what songs were on the War At The Warfield DVD. Slayer have so much respect for their fans…they wanted to make sure that a completely different set was filmed for the fans that evening and not a re-hash of the live DVD that was released prior. However, no one could really eat, as there was still no confirmation on whether or not the blood gimmick was really going to work as planned. The blood system was being put in place above the stage. A plan had finally been put together and implemented. However, because of time and costs, there would be no testing of the system. It was a one-shot-deal…it would either work or it wouldn’t. This was a good time for Slayer to say a prayer…I wonder who Slayer prays to.